The South Florida Bulls take on the Navy Midshipmen on Saturday at Navy Marine Corps Memorial Stadium. The opening line for this game has Navy as 11 point favorites and the over/under was set at 51. South Florida was led in passing last game by Quinton Flowers, who finished with 97 yards through the air. He went 9 for 20 on the game, good for a 45% completion percentage. Quinton Flowers was the rushing leader for the Bulls last game. He carried the ball 23 times for an average of 9 yards per carry and ended with 201 yards. Chris Barr was the team leader in receiving with a total of 41 yards and 3 receptions. He finished the game with an average of 14 yards per reception. As a team in that game South Florida got a total of 15 first downs by way of 10 rushing, 3 passing, and 2 by penalty. They ran 65 total plays for 352 yards for the game. The Bulls ran for 255 yards on 44 attempts. Navy was led in passing last game by Keenan Reynolds, who finished with 134 yards through the air. He went 7 for 11 on the game, good for a 64% completion percentage. Keenan Reynolds was the rushing leader for the Midshipmen last game. He carried the ball 23 times for an average of 2 yards per carry and ended with 38 yards. Jamir Tillman was the team leader in receiving with a total of 61 yards and 3 receptions. He finished the game with an average of 20 yards per reception. Navy got a total of 18 first downs by way of 11 rushing, 5 passing, and 2 by penalty. They ran 66 total plays for 291 yards for the game. The Midshipmen ran for 133 yards on 54 attempts. South Florida is averaging a total of 30 points per game on offense. In the air, they are attempting an average of 22.4 passes per game and completing 13.6 of them for a 60.5 percent completion percentage on the year. They are throwing for 172.4 yards per game through the air as well. The Bulls are running for an average of 236.1 yards per game on 44.3 attempts for an average of 5.3 yards per carry. They also run 66.7 plays per contest and average 6.1 yards per play for an average of 408.6 yards per game. The Bulls are averaging 19 first downs per game and they accumulate 59.7 penalty yards per game via 6.4 penalties. South Florida allows 252.1 passing yards per game and 22 points per contest on defense. They give up 20.6 completions on 34.9 attempts per game for a completion percentage of 59. The Bulls allow 127.4 rushing yards per game on 38.1 carries for a 3.3 average per play. South Florida allows 379.6 total yards per game including 5.2 yards per play. They force 1.9 turnovers per contest and get flagged for 7.3 penalties for 66.3 yards per game. Navy is accumulating 34.8 points per game on offense. In the air, they attempt an average of 7.7 passes per game and complete 4.2 of them for a 54.3 percent completion percentage. They throw for an average of 74.2 yards per game through the air as well. The Midshipmen run for an average of 301.7 yards per game on 56.2 attempts for an average of 5.4 yards per carry this season. They also run 63.8 plays per game and average 5.9 yards per play for a total of 375.8 yards per game. The Midshipmen get an average of 19.3 first downs per game and they average 38.7 penalty yards per game via 4.2 penalties. 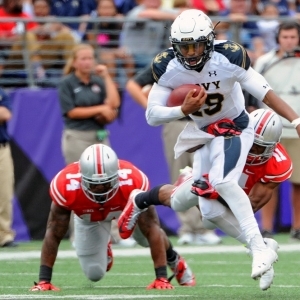 Navy allows an average of 214.7 passing yards and 19.2 points per contest. They give up 20.5 completions on 31.5 attempts for a completion percentage of 65.1 per game. The Midshipmen allow 148.2 rushing yards per contest on 37.2 carries for a 4 average per rush. Navy allows 362.8 total yards per game for an average of 5.3 yards per play. They force 2.2 turnovers per contest and 5.3 penalties for 44.5 yards in each contest.